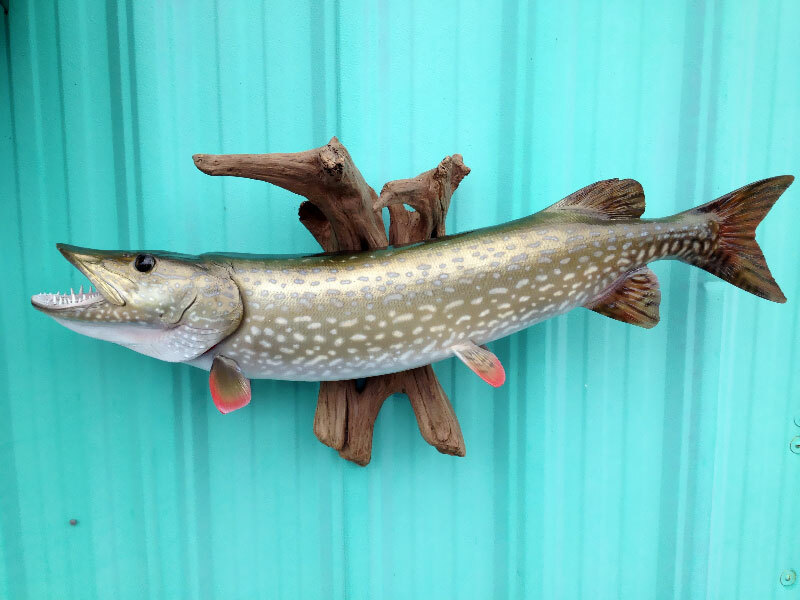 The northern pike (Esox lucius), known simply as a pike in Britain, Ireland, Canada and most parts of the USA, also called jackfish or simply “Northern” in the Upper Midwest of the USA), is a species of carnivorous fish of the genus Esox (the pikes). They are typical of brackish and freshwaters of the northern hemisphere. 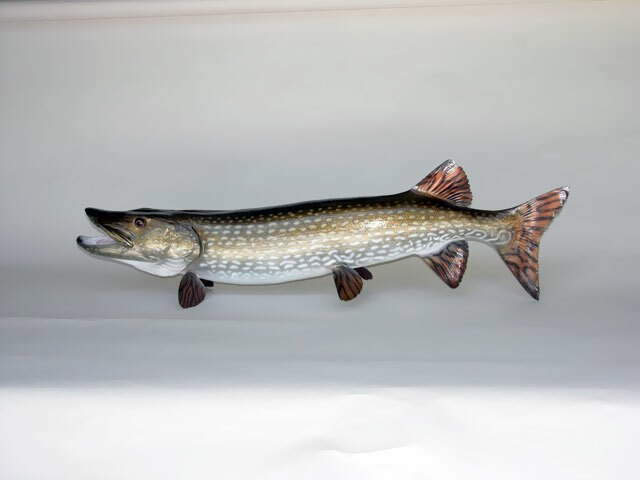 Pike grow to a relatively large size; lengths of 59 in (150 cm) and weights of 55 lb (25 kg) are not unheard of. The average length is about 28-47 inches (70–120 cm). The heaviest specimen known so far was caught in 1983 at an abandoned stone quarry in Germany, where the species is known as a Hecht. She (the majority of all pikes over 8 kg or 18 lb are females) was 58 in (147 cm) long and weighed 31 kg (68 lb). The longest pike ever recorded and confirmed was 60 in (152 cm) long and weighed 62 lb (28 kg). 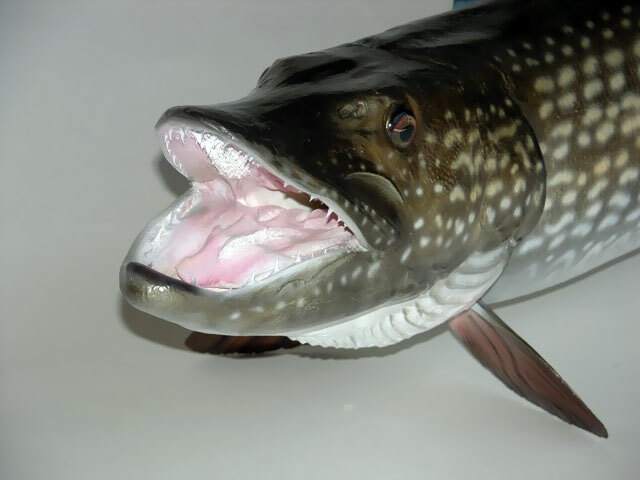 A pike of 60.5 inches (154 cm) was caught and released in May 2004 in Apisko Lake, Manitoba. Historic reports of giant pike, caught in nets in Ireland in the late 19th century, of 90–93 lb (41–42 kg) with a length of 67-68 inches (173–175 cm), were researched by Fred Buller and published in “The Domesday Book of Mammoth Pike”. Neither Britain nor Ireland has managed to produce much in the way of giant pike in the last 50 years and as a result there is substantial doubt surrounding those earlier claims. Currently, the IGFA recognizes a 55 lb (25 kg) pike caught by Lothar Louis in Lake of Grefeern, Germany, on October 16, 1986 as the all-tackle world record northern pike.